Medical negligence – Are you getting accurate diagnosis? Atul and Nalini (names changed) were over the moon on arrival of their new-born son. The delivery happened at a leading hospital in Coimbatore. But shortly, their joy turned into grief. Their new born son lost his eyesight due to sheer negligence in administering IV (Intravenous) by the duty nurse. The baby developed bacterial infections which spread to the eyes and thereby losing sight. Had there been timely intervention by doctors, this situation would not have arised. Laxity in treatment or aftercare. Infection due to medical tools like used Injections and Expired Medicine Dosages. The mentioned medical errors might happen because nothing was done, something was neglected or there might be laxity in the medical treatment and procedures. Lot of us presume that medical negligence cases happen only in the developing south Asian countries. But the truth is every part of the world is dealing with this medical malpractice. Let’s look into a recent case of medical malpractice held Tufts Medical Center, Boston, one of the top hospitals in the city which is focussed on providing excellent patient care. When Caroline Carcerano arrived there to get relieve from a back injury in November, 2013, she also underwent a tragic medical error. The neurosurgeon actually requested for some special dye to test the location of tubing that had been threaded into her spine. But due to the absence of the prescribed dye, the pharmacy provided a different one. The surgeon injected it twice after checking the label himself and Caroline died the following day. But can all premature death be termed as medical negligence? The answer is No. Not at all premature deaths can be termed as medical negligence. Only when there is considerable evidence of disregard in treatment or lapse in medical judgement, you can hold the hospital accountable. Let us take this tragic example of Australian cricketer of Phil Hughes died under harrowing circumstances while playing cricket on field. Inspite of best efforts and immediate medical care, Hughes could not be saved. This was definitely not medical negligence. Apart from this, there are instances when the patient is dealing with life and death situations, in that cases, prior to surgery, patients are warned of the risks involved and consent is taken on the same. Also if the patient fails to follow the post-surgery instructions and land up to a worse condition, then also the doctor is not liable for the situation. According to the Journal of the American Medical Association (JAMA), medical negligence is the third leading cause of death in the U.S.—right behind heart disease and cancer. 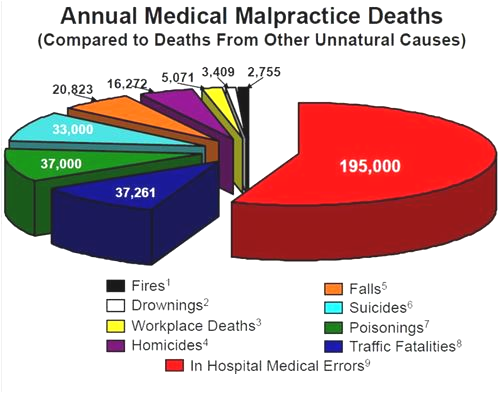 As per a report by McKeen and Associates, PC in 2013; “Medical malpractice, which included Medical Fatalities, Infection Deaths, Fatalities caused by unnecessary surgeries and hospital errors, accounted for more unnatural deaths each year than all of the other causes combined”. Image Source: McKeen & Associates, P.C. 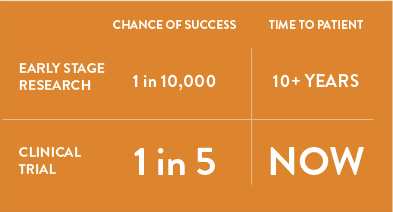 Did you know that 1 in 10 patient’s safety is compromised while receiving hospital care? Over 1.4 million people worldwide suffer from hospital acquired infections. Studies show that at least 50% of medical equipment in developing countries is unusable or only partly usable due to lack of knowledge on how to use. As a result, substandard diagnosis or treatment is meted out to patients and may result in serious injury or death. Duty: The Doctor owes its patient the Duty of Care , one the doctor/patient relation is established and must treat the patient same as other doctor would have done under similar situation with the medical procedures acceptable in medical community. Breach of Duty: The doctor who had the duty of care failed in executing it by not exercising the degree of care or medical skill that another healthcare professional in the same specialty would have used in an equal situation. Damage: The patient had suffered from physical or mental injury under the care of the healthcare practitioner. Cause: There must be proof of breach of duty by the doctor for the patient’s injury. Enactment of Consumer Protection Act, 1986 has brought into light of numerous cases related medical negligence cases. Due the awareness in society on the protection of rights of the consumer, many patients are now filing cases against their healthcare practitioner who showed medical negligence in their duty. But the question arises that what else can be done apart this. Though Medical malpractice law provides a way for patients to recover compensation from any harms resulting from sub-standard treatment, but the negligence already had caused the physical or emotional injury on the patient when going legal. Get a second opinion – It is always beneficial to take a second opinion when diagnosed with a serious condition. So, don’t be afraid to find a new doctor if you feel that you are not receiving proper medical care. Your health is of paramount importance. Though there are protection and legal laws against medical negligence, but it is always advisable not to take risk with your health and it is too important to provide it to the one who is not giving you adequate time, attention and medication. In an event of mis-diagnosis or lack of trust on the existing diagnosis, GrandOpinion helps patient and their family to cross verify the whole treatment plan at their convenience in order to avoid such untoward situations. GrandOpinion facilitates medical opinion for patients who need a second diagnosis and choose appropriate medical treatment. It is a moment of joy for the couple and the family when the news of a pregnancy is confirmed. And then begins a whole cycle of mixed opinions and advices from friends and relatives that can leave the mother to be rather confused! It is of prime importance for the pregnant lady to go in for regular check ups and scans to ensure that the baby is not predisposed to any congenital abnormalities. The chances of developing any abnormalities become high if either parent or some family member is suffering from a certain health issue. According to a success story on prenatal testing shared on www.wired.com , Candice * was happy when she got pregnant but had no clue that her grandmother had a baby with downs syndrome at the age of 42. The baby did not live long. Candice’s first child was born normal but at the time second pregnancy, she managed to conceive only after repeated miscarriages. Her pregnancy was closely monitored by doctors and for a while they thought things were going well. Her doctors made her do a blood test at 10 weeks to check for chromosomal disorders. Right enough the tests revealed the baby had downs syndrome. At 12 and a half weeks she terminated the pregnancy. She has been one of the lucky few moms who did not end up having a baby with downs syndrome and then losing it early. Birth defects are becoming increasingly common but the good news is that tests and scans help to detect these in early pregnancy and help prevent birth of such babies. A birth defect or congenital abnormality is defined by March of Dimes as, “functional or structural- that presents in infancy or later in life and is caused by events preceding birth, whether inherited or acquired.” In India a large number of birth defects are seen due to various reasons like universality of marriage, consanguineous marriages, many unplanned pregnancies, high fertility and poor antenatal care. Structural defects are physical defects with body parts such as cleft lips, cleft palates, club foot, missing valves or neural tube defects. According to John Cunha, birth defects occur either due to genetic factors, environmental factors or problems with chromosomes and are the leading cause of death of infants in the first year. Congenital heart defects which occur in 1 out of every 110 births. The symptoms of these defects include rapid heart beat, breathing difficulties, pale skin, swelling in the limbs and feeding problems. Surgery, mechanical aids like pace makers and drugs help to rectify such birth defects. Club foot affects 1 in 400 babies and if diagnosed in initial stages it is treated by just trying to put the foot in place, but in later stages braces and casts or in some cases surgery is used to treat it. Cleft lips and palates are a very common defect and should be surgically corrected 3 months after the birth of the baby. Spina bifida or malformation of a neural tube is another common defect and could be harmless or can cause severe problems like bowel control issues and paralysis. Treatment is according to the severity of the problem. Missing limbs, sickle cell diseases, metabolic disorders like phenylketonuria (PKU), downs syndrome, Fragile X syndrome a chromosomal disorder are the other birth defects which are commonly seen in pregnancies and in babies. Prevention they say is always better than cure and if taking certain small steps can help you have a smooth pregnancy and give birth to a healthy baby then these little steps are definitely worth taking. Increase intake of folic acid as it helps to reduce the risk of the baby getting neural tube defects. Control chronic conditions like diabetes, epilepsy, high blood pressure etc by consulting your doctor both before planning the pregnancy and during the pregnancy. Learn about genetics and ensure there are no genetic issues in either parent. If you still require more help, portals like www.grandopinion.com can be like a guide to you both while you plan your pregnancy and all through your pregnancy to ensure that you give birth to a healthy baby. Your doctor has just given you the most dismal diagnosis that your baby has a birth defect. You are still in the early stages of your pregnancy and wondering if you should continue with your pregnancy, how will the future of your baby be? You certainly need a Second Opinion and this is the time when GrandOpinion can make a difference to your life. We believe in helping with not just treatment but also with prevention. A doctor and guide like no other, GrandOpinion can indeed help you at every step of your pregnancy and help bring a healthy baby into this world. Leading a normal life, being physically active and eating right- everyone tries to follow these to stay healthy! But suddenly when a normal person discovers a lump, a cyst, or has a persistent cough, uncontrolled bleeding or any other major problem and finally comes to know about some critical disease he or she is diagnosed with their life just comes to a standstill! Of course technology has grown by leaps and bounds and the latest treatments are available in the market for all different types of health problems, but still there are those few people who end up with a bug of a different kind and at times need a new drug to help them! The answer to their problems is clinical trials. A clinical trial is usually a study involving patients-usually known as the subject- to improve medical knowledge, to prove that certain drugs are successful and can be used to treat humans. Usually there are two types of studies- clinical trials and observational studies. Clinical trials involve the use of drugs or devices to see the safety and efficacy of the product and observational studies assess health outcomes in groups of people. Does the new treatment work well on humans? Is the new treatment safe? These trials go on in many phases and a clinical trial is only one small phase. Each drug goes through at least 6 years of study before it comes into a clinical trial. And on an average it takes about 8 years for a drug to pass a clinical trial and come into the market. During these trials the doctors have to work closely with the patient’s (subjects) to see the effect of the drugs on them. The biggest challenge of these trials is the fact that not many patients are willing to participate in these trials. According to the American cancer society less than 5% adults agree to take part in clinical trials involving cancer drugs whereas 60% children take part in trials that is why survival rates of childhood cancer have gone up well in the recent past. Clinical trials are not simple procedures but involve a series of phases before they are considered successful and the product is ready to launch in the market. Drugs are tested for the first time on patients. It helps to decipher the dosage of drugs which the patients can tolerate. This phase includes pilot trials and final trials to evaluate the efficacy of drugs on the patients to see how it helps to treat or prevent the disease. Trials are demonstrated on patients who will eventually use this medicine prior to submission to NDA (National drug authority) and followed by a study post submission to NDA just before the launch in the market. The last phase involves studies on the medicine even after it is in the market to provide additional information on its efficacy and side effects. This is also known as post marketing surveillance. Clinical trials not just provide new drugs and devices to the medical field but also give a second chance and ray of hope to people suffering from critical health problems. Critical health problems are life threatening and not having a right cure for it can be even more disheartening for the patients. But clinical trials have proven to help such patients as well and have given them a new lease of life. Mary James an Afro American was diagnosed with breast cancer and she had a complicated form of cancer which needed multiple lines of treatment. 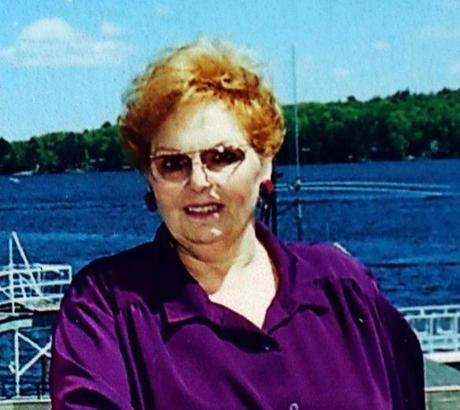 She needed a lumpectomy, followed by chemotherapy and radiation. Just as she finished her line of treatment her oncologist suggested her for a clinical trial of accelerated partial breast radiation. This involves comparing the standard breast radiation which takes 6 weeks with accelerated partial breast radiation which confirms the radiation close to tumour cavity and lasts only 5 days. Mary felt that the trial she went through has not only improved her chances of living longer but has also given her an opportunity to do something to make the place a better world. The outcome of these trials definitely provide a better chance to people suffering from critical diseases towards a new hope of living. Clinical trials provide solutions for other problems as well like osteoporosis, diabetes, Alzheimer’s to name a few. Osteoporosis is a metabolic bone disorder which involves thinning of the bone. A recent trial done at the Oregon Osteoporosis centre at Portland has shown that a drug called romosozumab, works well on osteoporosis by not just preventing further bone mass loss but also by promoting bone formation. 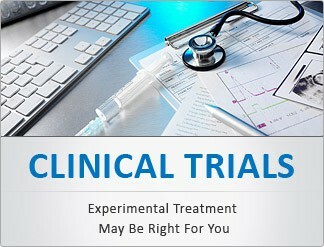 A clinical trial is a test of a kind and so not always successful. A drug failing a clinical trial and not coming into the market is better than a drug coming into the market and adversely affecting patients. One such example is of a clinical trial failure of a breast cancer drug called Cadcyla by Roche as it failed to give results superior to existing drugs. Several anti-inflammatory drugs have been withdrawn from markets following side effects during clinical trials. A failure in a trial is like a red signal to the pharma company to stop it from launching in the market. A diagnosis of a critical disease, multiple lines of treatment and your doctor requesting you to be part of a clinical trial- leaves you rather confused. If you are wondering who can guide you at this point of time, then the simplest guide and friend you can find is GrandOpinion. If you are dealing with a life and death situation and Inspite of regular medication and treatment, you see no improvement in your disease, and your doctor sees no ray of hope for your living, you can consult GrandOpinion for that second trail to life i.e. for clinical trials. Has your doctor told you about clinical trials? If not our doctors on GrandOpinion will guide you and tell you more about clinical trials and how they can help you find a line of treatment for the critical disease you are suffering from. Has your doctor been asking you to through clinical trials? In this case, GrandOpinion will help let you know if there is any other line of treatment available or clinical trial is the last option. Apart from these, the effects and side effects will also be clearly mentioned by our doctors. A clinical trial is a good option for many as it not just helps your problems and increases your chances of living but having been part of a trial you provide a great path for the future generations to come. Second medical Opinion is quite important for critical illness and diseases. With the rise of medical experiments, new treatment procedures, medical negligence and inaccurate diagnosis, this importance has elevated to another level. Getting a second opinion on illness, patients not only get an access to accurate diagnosis and newer treatment paths but also a different perspective on the illness. The success and innovations in the medical industry across the world are beyond any shadow of doubts. The infrastructure, quality health services, medical devices, constant research and development in pharmaceuticals etc all lead to the growth of the industry. Constant medical technology innovations head to better clinical outcomes and shorter recovery time. So the question arises- why do patients still seek second medical opinion? Is it lack of trust on the doctor’s diagnosis or is it the lack of relevant information to assimilate or you want to know best options available to tackle with the disease. Healthcare is the most sought after industry in the world. But with the boom of the healthcare industry, an equal percentage of cases pertaining to medical negligence and wrong diagnosis are coming into the picture. Also we can’t neglect the fact, that corporates run hospitals and issue revenue targets to the doctors. Doctors in turn search for potential candidates (a.k.a patients) to perform unnecessary surgical procedures which ultimately add to the overall revenue of the hospital. 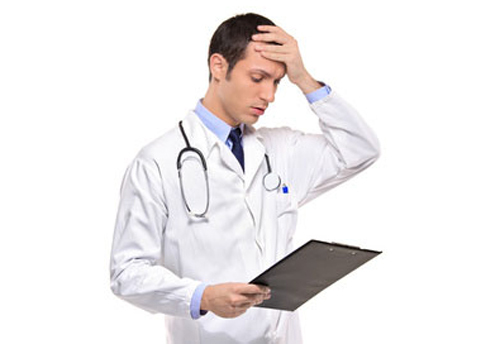 There have been numerous instances of doctors mis-diagnosing patients or insisting on unnecessary surgical procedures. WHO lists Medical misdiagnosis among the top 10 killers in the world. As per British National Health System survey conducted in 2009, 15% of its patients were misdiagnosed. Another report by The Pennsylvania Patient Safety Authority, Diagnostic errors are present across every specialty. For perceptual specialties (like radiology, dermatology) the percentage of error is less than 5% but for other clinical critical specialties the error percent ranges from 10% to 15% in US. Ashish Dhar and Sachin Shah formed GrandOpinion, a place where anyone can get a second opinion on their medical illness from the industry experts. When one of the founders underwent a similar situation of misdiagnosis in his family, the duo realized the need of any such organizations and thus they wanted to bring about radical change in the way patients interact with their doctors. GrandOpinion use a simple flow “right diagnosis to be made at the right time”. In India there is a wide spread of ‘white coat syndrome’ i.e. the doctors are kept on a pedestal by the patients and their families. Most of them blindly follow the instructions without questioning or understanding them. Though this is changing slowly with the advent of internet. But many a time self – medication or self – diagnosis can be dangerous as internet mostly provides us with unnecessary and unauthorized information which may confuse the patient and they may land up to a riskier position. In the urge of eliminating this risk and providing patients with accurate diagnosis, GrandOpinion got its identity. The company launched its branches in USA, Delhi and in China. Ashish Dhar, Co-founder, GrandOpinion shares “We have created a simple no fuss model which is easy to use for patients and their families. With the help of technology, it is easier to seek opinions for top medical professionals at click of a button without having to travel or spend a lot of money”. GrandOpinion is for patients who are battling with serious health conditions and in need of immediate second medical diagnosis. GrandOpinion provide patients a different perspective on their disease, with positivity and a better path towards recovery. Apart from individuals, corporate houses and organizations can invest in this service of Second Opinion as it helps employees get accurate diagnosis from the beginning. GrandOpinion has a virtual clinic which matches patient to doctor who are specialized for a particular medical condition or disease . This is done to ensure that both patient and doctor are connected on the same level and immediate diagnosis can be given without having to resort to unnecessary repeat tests. Opinions are given on basis of existing test reports and a case coordinator is assigned to keep track of the case. Since all the records and conversations are digitally recorded, it can be accessed anytime from anywhere. All consulting doctors in GrandOpinion are recruited only on basis of recommendation and their research in a particular specialty. Medical diagnosis varies from one physician to another. By taking a second opinion, one can choose between new options for treatment and can cross verify the original diagnosis and treatment plan. GrandOpinion helps patients and their families to make informed treatment choice and choose a better treatment plan.